Let's revisit one of my all time favorite fund raising ideas: Flocking! What is flocking you may ask? 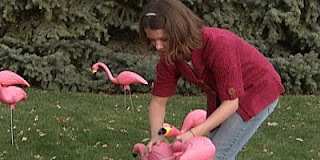 Flocking is surprising someone by decorating their yards with an army of plastic pink flamingos - probably the best idea ever. Unsurprisingly, this is fast becoming a fund raising trend among Girl Scouts. In North Platte, NE, NBC News 2 is reporting on Jayla Trosper, a scout who is flocking to raise money in order for her troop to visit Savannah Georgia - the birthplace of Juliette Gordon Low, who was the founder of girl scouts - and all around beautiful city... In other news, I wish I had a yard for people to flock. I am a big proponent of pink flamingo decorations, in any capacity.